Inscribed on back of canvas: Coleridge. This portrait was painted by Mr Vandyck, a descendant of the great Van Dyck, invited over from Holland by Sir Joshua Reynolds – 1796; this inscription is no longer visible but a copy has been preserved in the NPG archive. The portrait was painted for Joseph Cottle, bookseller of Bristol and Coleridge's friend and patron who published his first volume of poems in 1796. Cottle at the same time commissioned portraits of Southey, Lamb, Wordsworth and Amos Cottle, and described them all in his Early Recollections Chiefly Relating to the Late Samuel Taylor Coleridge in Bristol, 1837, xxxi-xxxiv. Vandyke had been Reynolds's assistant and drapery painter and had settled in Bristol after his death. 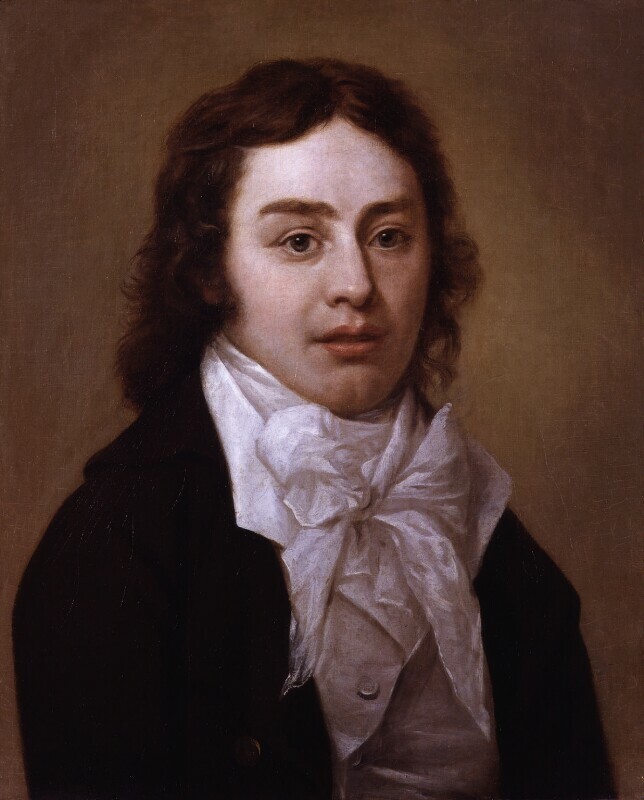 'His portrait of Mr Coleridge did him great credit a a better likeness was never taken; and it has the additional advantage of exhibiting Mr Coleridge in one of his animated conversations, the expression of which the painter has in a good degree preserved' (ibid. xxxi). Cottle's niece, Elizabeth Green, inherited the group of portraits from her uncle together with a large collection of letters and MSS sold at Sotheby's in 1864. The portraits of Coleridge and Southey she sold separately to the NPG. Head and shoulders slightly to right aged 24, in a dark brown coat, grey waistcoat, voluminous white bow-tie; brown hair, brown eyes, pale complexion; plain buff background. Joseph Cottle, then his niece Elizabeth Green who sold it to the NPG in 1864 together with a portrait of Southey. Stipple by Woodman, 'From a Painting by Vandyke (1795) in the Possession of Mr Cottle', used as frontispiece to Joseph Cottle's Early Recollections, 1837.